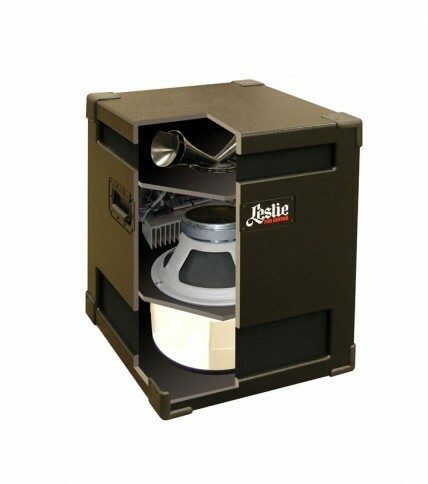 Leslie G37 rotating speaker for guitar with built-in power amplifier. We will need to use UPS to ship this one. ** FREE SHIPPING IN THE NORTHEAST!!!! Or Email for the shipping price. Analog Man carries the Leslie G37 rotating speaker for guitar, this one has it's own built-in amplifier, and gets the best REAL rotating speaker sounds ever! Hammond proudly introduces a new line of revolutionary Leslie speakers, namely the Leslie G27 and Leslie G37, especially designed for the professional guitarist. After countless interviews and hundreds of hours of product testing with famous guitarists around the world, we have developed the perfect Leslie for guitarists. The Leslie rotary speaker has been a permanent fixture in studios and on stage for decades. But until now it has always been made with keyboard instruments, namely the Hammond tonewheel organ, in mind. The Leslie G37 changes that: it’s a rotary speaker with in-built amplifier designed for guitarists. The standard elements of the Leslie cabinet are employed in the G37, with a 12-inch speaker that feeds a rotating drum, coupled with the famous spinning treble horn. Unlike the traditional Leslies, where a crossover splits the incoming signal and sends the high- and low-frequency components to the horn and the woofer respectively, the 12-inch driver is fed the full-range signal, as in a regular guitar amp. The horn provides “emphasis”, and helps to provide the much-loved Leslie sound. The guitar amp in the new Leslie has been specially designed for the G37 and has a tube-based preamp and a 100-Watt solid-state output stage. It’s got two channels — clean and overdrive — and features a three-band equaliser. A footswitch for channel selection is available, as is a speed control for the rotors, which is a departure from the simple fast/slow switch used to control Leslie cabinets that have preceded this one. This pedal gives the user the power to vary the rate at which the rotors spin, and therefore create sounds unobtainable on previous Leslies. Also seen for the first time on the G37 is a clever feature that ensures that, when the rotors stop, they always face forwards so the cabinet can be used like a conventional, fixed-driver guitar amp. If the resting point of the rotors was uncontrolled (like with traditional Leslie cabinets), every time the motors were switched off, the sound coming from the front of the cabinet would be different as it would be projected in random directions. A version of the G37 without the amplifier, called the G27, is also available. 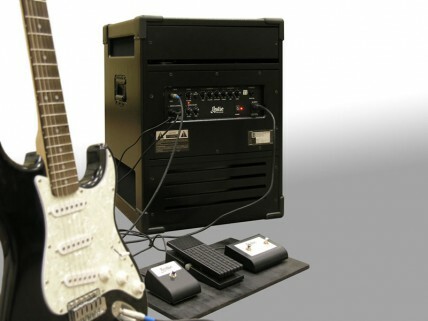 This can be used with any guitar amp just like any other passive cabinet.